Did you know it’s National Comic Book Day on September the 25th? It’s not like your little ones really needed an excuse to wear their favourite superhero costume to the supermarket (helping mum buy groceries is naturally more interesting when you’re Batman) but on the 25th it should be actively encouraged. To celebrate this super-powered special day we’ve created a superhero colouring-in template and a simple superhero puzzle craft to make and do! What do you need for the superhero puzzle craft? We have to admit: You don’t always have a big number of ice lolly sticks handy. Especially with how the weather’s been treating us. But you can buy them in many craft shops, and they’re a handy item to have in the craft drawer! The nice thing about this self-made superhero craft is that you can easily adjust it to suit your child’s age. 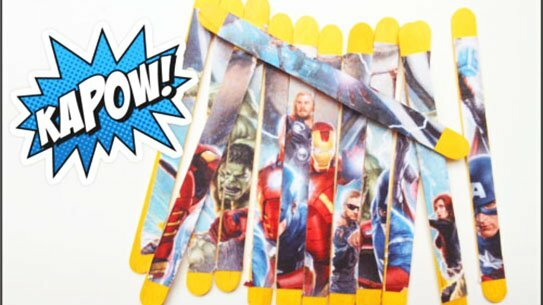 These lolly stick puzzles are simple enough to solve if you only use a small superhero drawing, which fits on 4-5 lolly sticks. But the more you make the better they get! If you stick with the comic book theme you can merge different pictures together, making the ultimate superhero! These kind of puzzles offer a nice mix of mathematical challenges and practice fine motor skills, with a heap of creativity and imagination thrown in. Your child will probably only need a little help with cutting the lolly stick puzzle if they’re 5 years or above. For younger children you will need to be a good and patient assistant, waiting for the little one’s call for help. They will probably explore different ways of laying out the lolly sticks before making a final decision. This is great practice. Encourage them to test the layout before they do any gluing. 1 Line up the lolly sticks and make sure there are no gaps between them. 2 Cut out your comic book image and line it up on the lolly sticks to make sure it fits. If it doesn’t quite fit on, add more lolly sticks until it lines up perfectly. 3 Put a few drops of glue on the back of the comic book picture and use the paintbrush to spread it around. Carefully place it back on top of the lolly sticks. This bit can be a bit tricky, because the lolly sticks might slide around. 4 Around the picture you can add some extra superhero-style words and shapes. Kapow! 5 Call upon your super grown-up assistant to help! Use the craft knife to slice down the grooves between each lolly stick. If the image becomes a little unstuck around the edge, add more glue to press it down. Leave to dry. 6 Mix up the lolly sticks and see if you can piece your puzzle back together again! If you want to make the puzzle a little trickier, add a second image on the other side of the lolly sticks. Re-line the lolly sticks up again, with their backs facing upwards. Glue another image onto the back. When it’s dry, jumble up the lolly sticks. How quickly can you reassemble the puzzle? Set a timer, press ‘start’ and hit ‘stop’ once it’s completed. You could create a super-speed tournament, and time members of your family to complete the puzzle. Who’s so quick that they could give the Flash a run for his money? If you are done with the superhero puzzle (or you don’t have any lolly sticks to hand right now) we’ve created a super easy Hero Designer printout. It’s blank to allow some very crazy creative input. Finally, you can design your own hero! Have a think about what kind of hero your super pal is. What is their superpower? How do they help people? Do they have a secret identity? What does their costume look like? If you have some spare superhero stickers kicking about, they’ll make an epic addition. 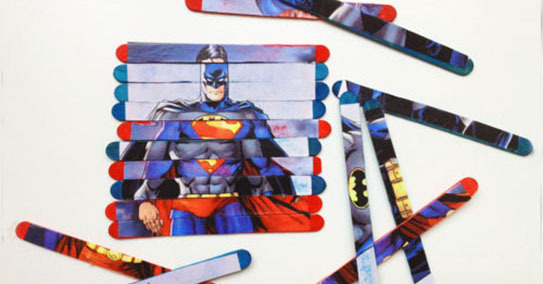 Stick them on the paper to create an exciting superhero scene to hang up in their secret lair. Or bedroom; we’ll leave that up to you. 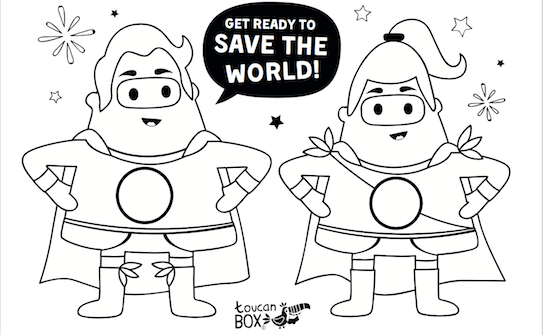 Or your child can cut out the coloured-in superhero, and mount it onto some cardboard for some imaginative role-play. There are unlimited possibilities.